Fukushima evacuation: Some people are safer in a fallout zone than as refugees. Is Living in a Nuclear Evacuation Zone Good for You? Fukushima’s legacy may be mental health problems, not cancer. 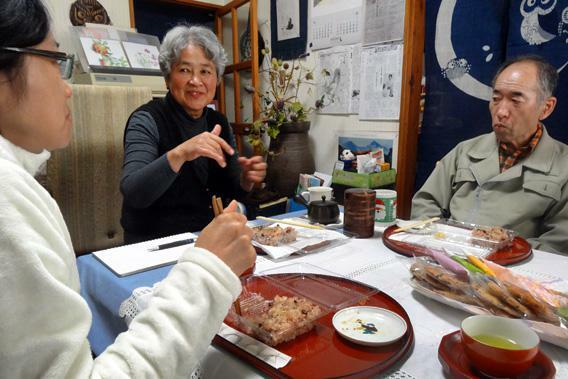 Naoko Ito, center, shares a meal with her husband, right, and Mai Nishiyama, the author’s translator, in November 2012 in Naraha, Fukushima Prefecture. When the evacuation order came two years ago, Naoko Ito had to decide whether to stay or go. Her house had just been rocked by the great Tohoku earthquake, and an ensuing tsunami had washed away part of her seaside village. Her home seemed to have come through the worst of it, but just 10 miles away another crisis was brewing at the Fukushima Daiichi nuclear power plant. The tsunami had flooded emergency systems and a meltdown seemed imminent. The authorities wanted everyone out. Most residents fled, but the Itos stayed behind. 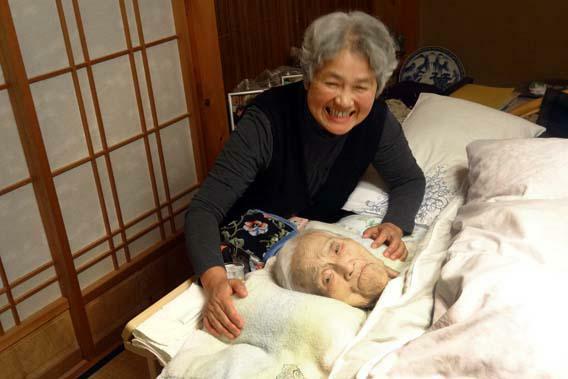 The reason was Naoko’s mother, who was in her mid-90s and suffering from dementia. Naoko feared that the move might kill her. She turned to her husband and said, “’I’m going to stay with my mother because I can’t leave; how about you?” “OK, I am going to stay,” he replied. Nobody died. When I visited the Itos in November, Naoko, her mother, and her husband were all fine. Over a meal of rice and azuki beans, she told me that life was a lot like it was before the accident. She cares for her mother, and her husband tends the small patch of land they once grew vegetables on. (He’s now growing sorghum to try to absorb the radioactive cesium in the soil. So far, he says, it isn’t working.) The neighbors are gone, but she never liked her neighbors. Most of the shops in town have closed, but a Seven-Eleven just up the road is still open; it caters mainly to contractors working to clean up the ruined plant. The biggest inconvenience is that the town’s water has been shut off. On Mondays and Fridays she goes to the local fire station to pick up a few jugs. “Once you get used to it, it’s not that bad,” she says. Her story stands in stark contrast to those who evacuated. During the same trip, I met the Togawa family, who fled from another town near the plant. The Togawas had three small children—a very good reason to run, since kids are more susceptible to radiation exposure. But life for them hasn’t been easy since the accident. They lived for months in shelters and are now crammed into uncomfortable evacuation housing. The family’s father, Kenichi, had to find a new job. He’s lost his friends and his judo club and now spends his days at home playing video games. He’s put on weight and is drinking more than he used to. And the Togawas are doing better than a lot of others. Some families have split up: Wives and children have gone to other prefectures while the husbands stay behind to work. Many evacuees are unemployed, and some have taken up gambling or started drinking heavily, according to several people I spoke to. Given these problems, more than a few health experts now believe that mental health problems, not cancer, may turn out to be Fukushima’s legacy. A recent report by the World Health Organization suggests that most of Japan will not get sick from radiation released by the Fukushima accident. The most serious consequence will be a predicted 70 percent increase in thyroid cancer risk for female infants who lived near the plant at the time of the accident. Since the baseline rate of thyroid cancer in Japanese women is 0.75 percent, this means that the rate may increase by about 0.5 percent. That rise is probably too small to be detected statistically. Meanwhile, psychiatrists and public health officials are worried about the future of more than 150,000 evacuees who remain displaced. Plenty of Fukushima’s residents had no choice. Levels of radioactivity are high in the region around the plant. It wouldn’t be enough to cause cancer right away, but over the course of years and decades, people might start to get sick. Even if they didn’t, sticking around wouldn’t make sense. Farming and fishing were mainstays of the local economy, and no one will buy contaminated products from the areas near the plant. A few hundred square miles of rice paddies and seabed have been abandoned around the plant, and despite government efforts to speed clean up, it will likely be decades before anyone will be able to work the land and coastal waters again. Naoko Ito, left, and her elderly mother, in November 2012 in Naraha, Fukushima Prefecture. But the situation for the Itos is different. Already in their 60s, they’re pretty much retired and too old to be worried about prolonged, low-level radiation exposure. They very well may have saved her mother’s life. A recent study found that mortality rates shot up among elderly patients who were moved from their nursing homes during the crisis. They’re happy, Naoko says. Contrary to expectations, it seems like living inside a nuclear evacuation cordon turned out to be the healthiest option.